Farming alongside the Great Barrier Reef is under intense scrutiny, in particular, the potentially harmful impact on water quality from run-off that contains nutrients, pesticides and sediment. Water management is now more important than ever for farmers to ensure they can maintain productivity and profitability while protecting the environment around them. CANEGROWERS welcomed the 2016 Reef Report Card and its finding of progress towards targets for nutrient, chemical and sediment run-off. Dan Galligan, CANEGROWERS CEO, said the 2016 report was based on data which did not include much of the latest industry efforts to improve water quality in the catchment areas. “The hard work and positive changes growers have been undertaking on their farms will continue to show the Australian industry is a world leader in sustainable sugar production and we are proud of our achievements,” Mr Galligan said. The Queensland Government is continuing to support new and innovative ways to reduce run-off into waterways with significant investment and projects underway throughout the state. The government has acknowledged that progress is being made towards the Reef 2050 Water Quality Improvement Plan’s ambitious targets, with land use practices changing and resulting pollutant loads declining. water sample as part of Project 25. 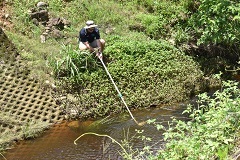 Water quality monitoring initiatives continue to be rolled out in cane farming districts helping growers to see first-hand the science behind the studies and gain a great understanding of how changing farming practices can lead to positive environmental outcomes without comprising their productivity or profitability. Project 25 – a water quality monitoring initiative launched in 2015 and funded under the National Environmental Science Program – was designed to put some of the control back into the hands of the farmers. Reef and Rainforest Research Centre managing director Sheriden Morris said the project had been designed from the very beginning to revolve around farm input. “When you try to look after the Reef, it’s essential that the key players are involved, especially the cane industry. It isn’t acceptable to have a researcher turn up, sample at the river mouth and start attributing blame. That's not incentive to progress to a better outcome," Ms Morris said. “Farmers all over have been putting in the hard yards for years, updating their practices through programs like Smartcane BMP and Reef Rescue. Where good progress has been made, there hasn’t been sufficient recognition for that. When growers get ignored or demonised in the media, that breaks down trust and it’s a poor outcome for everyone. Project 25 is about putting the control back into the hands of the farmers and making sure they’re a key part of collecting the information and delivery conversation outcomes.” Read more.